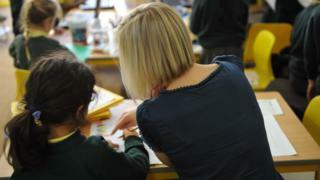 Scotland's largest teaching union is set to reject new proposals to increase salaries. However, employers - represented by councils and the Scottish government - have suggested 3% for those earning up to £80,000 and changes to pay bands. The union is set to respond formally to the offer at a meeting on 18 September. It has warned that unless a suitable deal can be reached, it could ballot its members for industrial action. The EIS has already rejected proposals put forward by employers in March for a 3% rise for staff earning up to £36,500, capped at 2% for those on higher salaries. The current offer would also see the small number of education staff working for councils and earning more than £80,000 get a rise of £1,600. The changes to the teachers' pay offer are similar to the revised offer for council workers made last week. In a statement. the EIS said: "We will continue to negotiate in good faith with both Cosla and the Scottish government. We must be preparing, also, for the likelihood of a ballot during this session and the possibility of industrial action." The union is planning a large national rally in support of its 10% pay claim at the end of next month.